The '90s Zone: Wayne's World! 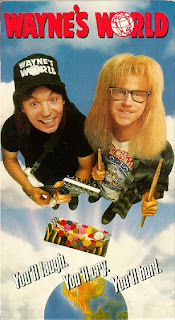 Wayne's World! Yeah sorry not making advertising the focus of this week like I planned! One of my favourite all time movie duos. This one's dedicated to my boys Ben and Dustin, with whom I've seen these movies like a thousand times. Srs. We watch them like once a year and I always piss myself. I can remember being a wee lad who loved Austin Powers seeing the poster for this in Blockbuster. My mother didn't have much affinity for them (saw them when they first came out and thought they were so stupid. can't blame her) but I remained in awe. I caught it on cable for the first time not long after that, and apparently so did my aforementioned chums. We watched and watched and watched them. I think that was how we learnt the words to Bohemian Rhapsody. But isn't that how everyone does?